They just snuck ahead by one vote so they will be the couple moving into this adorable house in Willow Creek (BUT THE OTHERS ARE GOING, TOO!!!)! You can follow their story (and those of the other AMAZING residents) here! In a clichéd case of boy meets girl, Angel and Howie met at a couple’s cooking class. Angel’s date, Jon, sliced his palm open while trying to show off his lack of knife skills. Howie’s date, a nurse named Liz, came to the rescue and took him outside the kitchen to clean up Jon’s wound. Left on their own, outgoing Howie introduced himself to Angel and assured her that Liz was a great nurse. Angel didn’t seem worried and cheerfully brushed off his concerns. This was the third date she’d been on with him and also the third time they’d had to visit a first aid station (her date was both self-assured and clumsy). The two worked apart, goofily chatting as they prepared their meals. Several minutes later Liz came back in, her shirt specked with blood. She told Angel that Jon needed stitches and would need to visit the hospital. As Angel prepared to leave, Liz offered to take him there herself since she was no longer suited to finish the class looking how she did. Angel agreed and gave Liz her phone number so she could contact her if they needed anything. Liz would later find that her kind offer helped fuel the deterioration of her own relationship. Angel and Howie paired up for the remainder of the class, laughing, joking, and finally eating their completed meals together. Afterwards they took Angel’s car to the hospital to meet up with their dates. Angel had, by this point, decided that Jon probably wasn’t for her and didn’t plan any future dates with him. Howie, on the other hand, was completely entranced by Angel. He had a good excuse to see her again, too, as he left his jacket in her car (completely accidental, of course). He asked Liz for Angel’s phone number the next morning and asked if he could meet her to pick it up. She instead offered to drop it by during her lunch break. She ended up staying at the coffee shop in Willow Creek where he worked for her entire break. Howie realized he had very strong feelings towards Angel and struggled in his relationship with Liz for several weeks before Hurricane Mortimer suddenly arrived. Liz was constantly at the hospital and Howie, newly unemployed (the coffee shop was destroyed in the storm), had a lot of time to think and be by himself instead of with Liz. They mutually broke up shortly after. Howie asked Angel out almost immediately after his breakup and the two fell fast in love. 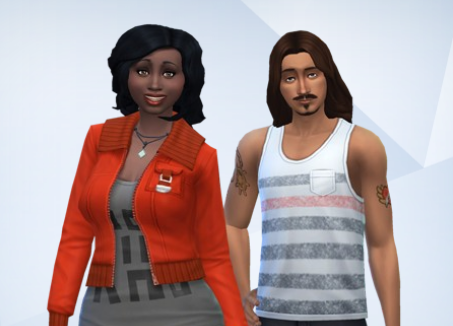 They became exclusive and decided to move in together some place in Willow Creek for more affordable real estate. They’re not yet engaged but Angel could definitely see herself married to Howie and starting a family. For now she’s happy teaching at the local elementary school. Howie decided to follow his passion and is now working in a modern art studio and perfecting his own abilities. He has dreams of opening his own studio one day. Career: She would make a good teacher (if you’ve got the education career mod) but otherwise anything would work for her (if you don’t want to go that route you can delete the bit up there about teaching). In the future she would enjoy being a stay at home mom and keep a garden or even help run Howie’s art studio. ← Ikeda Legacy: Meilin is ALIVE! Ooh! I love the bit about her being a teacher — I’m gonna download that mod regardless! And omg, I love Howie’s super long hair xD Awesome entry! Yessss! It’s a great mod! I could see Howie being a guitar player! He’s kind of an art hippie sorta dude, lol. My guy was a grumpy metalhead. 😀 But they look real similar physically.